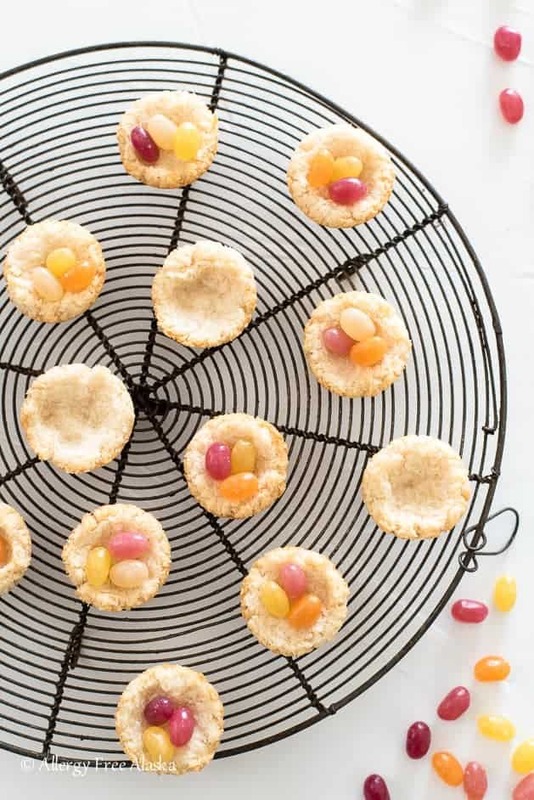 These Gluten Free Vegan Coconut Macaroon Nests are such a fun allergy-friendly Easter treat, filled with organic jelly beans, they are totally dye free and corn syrup free. Your kids will love them! But, I have children… and while I don’t want them to get into the habit of eating candy all the time, I’m totally okay with special treats occasionally. Like at Easter! My youngest has a horrible emotional reaction to corn syrup and artificial food dyes, so finding candy that fits that, while being gluten and dairy-free can be hard (not that I’d want my girls to eat corn syrup and artificial dyes anyway). I was putting together a Vitacost order and stumbled across these Surf Sweets Organic Jelly Beans. 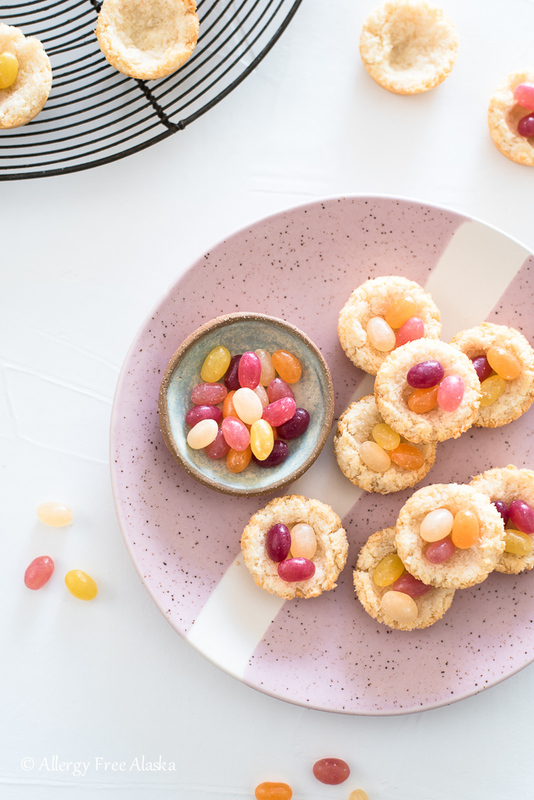 Surprisingly, they have really clean ingredients and are completely artificial dye and flavor free (they are also top-10 allergen free for anyone who may need it). I bought the girls each a small bag and haphazardly stored the bags away in the cupboard when the box came in and the girls weren’t looking. Please tell me I’m not the only parent who has done that?! I use aquafaba as a substitute for egg whites. Aquafaba is the liquid brine from a can of chickpeas (also known as garbanzo beans). Simply open a can of chickpeas, and measure out 1/2 cups of the brine for this recipe. I save my chickpeas and use them for salads the remainder of the week. You probably could substitute coconut sugar for the organic cane sugar, but then your nests would be more of a brown color, instead of being a yellowish/golden color. If you have a nut allergy and can’t use blanched almond flour, try substituting 1/4-1/3 cups of additional unsweetened shredded coconut in its place. The unsweetened shredded coconut will absorb moisture, unlike the blanched almond flour, so that’s why I suggest only using 1/4-1/3 cups instead of 1/2 cup. 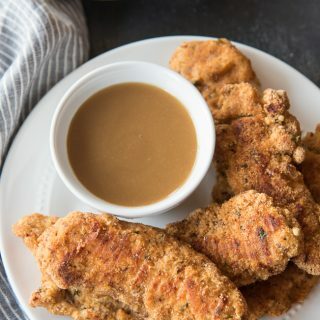 Just keep in mind I haven’t tried making this recipe without the blanched almond flour, so you’ll have to experiment to find out what really works. 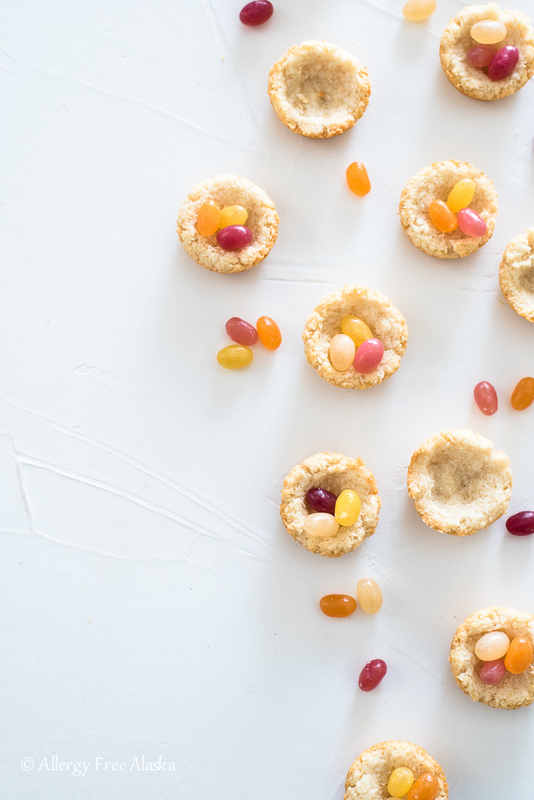 You don’t have to use jelly beans in this recipe, you could easily use your favorite chocolate chips, or whatever candy works for your families’ dietary needs. When I first showed my girls these sweet Gluten Free Vegan Coconut Macaroon Nests, they went crazy. They loved them so much and couldn’t wait to eat them. I hope your kiddos react the same way. Much love to your family this Easter! Preheat oven to 300 degrees (F) and liberally grease a mini muffin pan with oil (I like to use an olive oil spritzerlike this one). 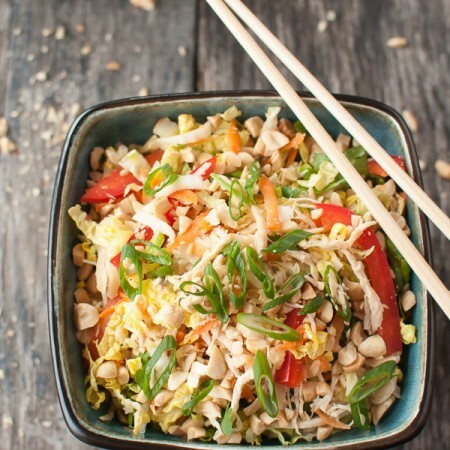 In a large mixing bowl, combine the unsweetened shredded coconut, blanched almond flour, organic cane sugar, and sea salt. Add in the aquafaba, maple syrup, and vanilla extract, and use a sturdy spatula to mix until well blended. 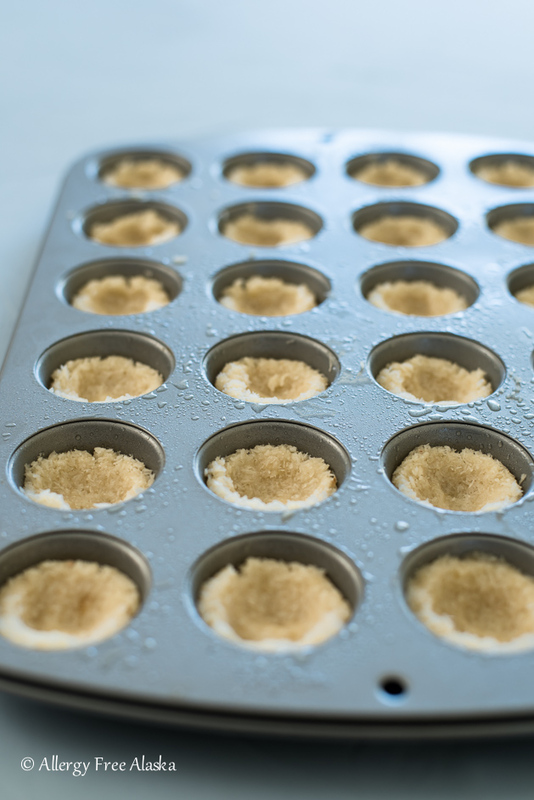 Drop a packed tablespoon of the coconut mixture into each mini muffin tin. 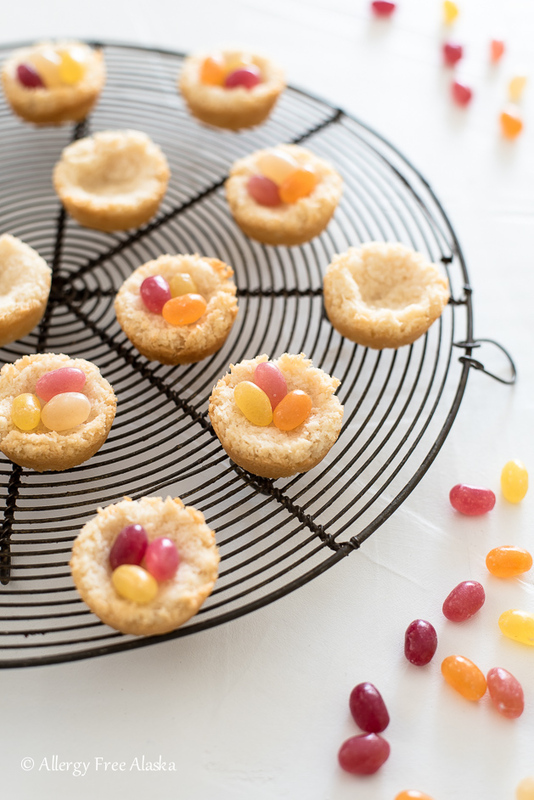 Use your fingers to press the coconut mixture into the tin and partially up the sides (about 3/4 of the way up the sides), making a well in the center to hold the jelly beans. Bake for 20-25 minutes, or until the macaroon nests are golden brown around the edges. Let the macaroon nests sit for 5 minutes before removing from the mini muffin pan to cooling racks to cool completely. Use a butter knife to gently pry the bites out of the tins if needed. Once cool, place 3 jelly beans in each nest. Aquafaba is the brine from a can of chickpeas (also known as garbanzo beans). Simply open a can of chickpeas, and measure out 1/2 cups of the brine for this recipe. Aquafaba is an excellent substitute for egg whites. Macaroon recipe adapted from Neurotic Mommy. These are adorable. I look forward to making them. The chickpea juice I’m not so sure of. Lol. If I wanted to use egg white, any idea how many to use? Thanks so much. These are my new holiday must have treat! So yummy! Yay! Thanks, Demeter! You will love these! What a great treat for the kiddos for Easter! These will be perfect for my son’s class party! So cute! Yay! So happy they will work for his class! 🙂 The kids will love them! These are adorable! Definitely making these for Easter! So cute and so versatile, love these! I am always looking for more GF dessert choices. Can’t wait to try these! These look so mouthwatering! Yummy! Thank you so much! They are definitely a fun treat! 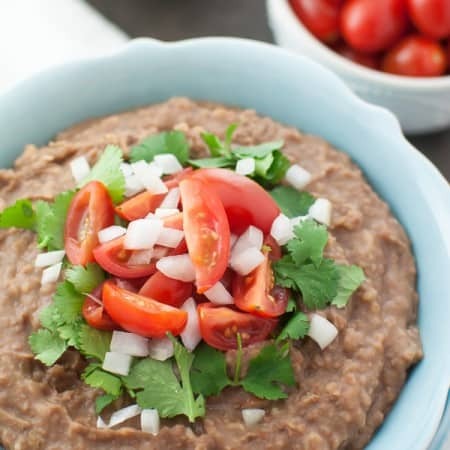 can’t do legumes or eggs…any other suggestions? Gelatine egg? That’s tough, Sara! You might have to experiment a bit. A gelatin egg sounds like something that might work! Just know I haven’t tried it myself.